This is going to be a tough one, but I have to give it a try. 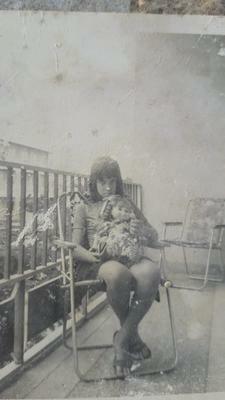 In the picture below is my mom with her most loved doll. It was given to her in the early 70's in Angola, where she lived. When the civil war started my mom and her family had to run away and the doll was lost somewhere along the way... she is 54 years old and she still talks about it. My mom used to say that this doll was a Pippi Longstocking doll, but I'm not sure if it really was the doll's commercial designation or if my mom used to call it that because of her striped socks. *Update: the doll has orange hair and freckles on her cheeks, the dress was greenish and the socks had multiple colors. The body was soft except for head, feet, and hands and had ribbons in the hair. Can you please take a look? I appreciate any information. Thank you so much!